When You Think of Digispec®, Think of the largest dedicated mouse pad manufacturer in the United States. With over 350 million mouse pads produced, we've been trusted with more mouse pad promotions than any other industry supplier. 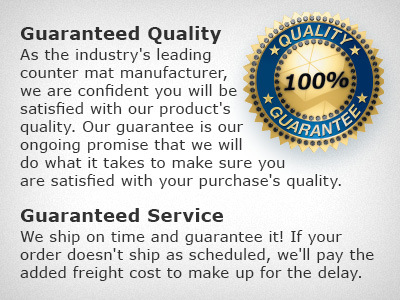 Our mouse pad expertise and devotion to customer service means you can always count on Digispec® to deliver the Solid Quality, Reliable Service, and Competitive Pricing you need to delight your customers and grow your business. Founded in 1983 - Still Going Strong! From two young families working in our garage in 1983 to over 200 employees, our growth and experiences have been magnificent. As we look back over the years, it seems we've manufactured mouse pads for every major brand on the planet. Amazingly, we've made over 350 million pads, which is enough to circle the globe more than 1½ times. We've had the privilege of being the industry leader in our category and have been honored with almost every industry award available. It has been a rewarding, challenging, wild ride! After these many years, we are mindful of all the customers, suppliers, employees, and friends who made this all possible. We wouldn't have wanted to do it without you. For more about our company, see the Digispec® News below. Put a face on the people who make up the DIGISPEC® Team or, better yet, take a look at our Trade Show Schedule and come visit us in person next time we're in your area. Thank you for your interest in Digispec®. Specialized Technology Resources, Inc. has ensured DIGISPEC, CounterPoint and Visstun products conform to applicable Prop 65 and CPSIA safety standards. LAS VEGAS, NEVADA (August 28, 2009) — In the ever-changing regulatory environment in which business is done, product safety is top-of-mind in the promotional products industry. DIGISPEC®, and its sister companies CounterPoint® and Visstun®, have successfully completed third-party audits of their products and practices, which conform to applicable Prop 65 and CPSIA safety standards. The tests were conducted by Enfield, Connecticut-based Specialized Technology Resources, Inc. (STR), a leading, independent testing and accreditation agency that provides audit services to 140 countries around the world. All product configurations of the entire DIGISPEC and CounterPoint lines were tested for heavy metal content, lead in accessible substrate materials, flammability of solids and NERC toxics in packaging. All were found to be compliant with applicable Proposition 65 (lead and cadmium) and CPSIA child safety standards and regulations. All Visstun products — including plastic and paper cups as well as color changing ink and glow ink — were also found to be compliant. The line was tested for aesthetics, leakage and contamination, capacity, ink/coating adhesion, heavy metal content, FDA extraction, phthalates and microbiological contamination. Certificates of Conformity may be viewed at www.digispec.com/safety, www.doyoupop.com/safety and www.visstun.com/safety. "With all the recent concerns over product safety, especially for children, we have been proactive and are taking all precautions to meet Prop 65 and CPSIA guidelines," said Ed Hamilton, DIGISPEC president. "We want to make sure we provide all necessary information to distributors so they are confident that the products they purchase from us are safe and compliant." Founded in 1983, DIGISPEC® is a manufacturer of custom corporate mouse pads using state-of-the-art equipment and quality American-made materials. When the company purchased Minneapolis-based XJD Corp in 2002 and acquired Linden, Utah-based DataPad 2003, it became the largest mouse pad manufacturer in the promotional products industry. To date, it has produced more than 250 million mouse pads. Since 2000, DIGISPEC has been honored more than 50 times by industry associations, publications and distributor companies, including receiving a Counselor Distributor Choice Award for nine consecutive years and being named by Counselor as a Best Places To Work in 2008. The company has received 10 PPAI Supplier achievement awards, most recently as a finalist in the Offset Process category in the upcoming awards ceremony in January 2010, as well as four PPAI Supplier Star Awards of Merit. DIGISPEC, along with its sister companies CounterPoint®, Visstun® and AwesomeEye®, is part of the Time's Up, Inc. family of companies founded by Ed Hamilton. While each division operates independently, all four are headquartered in Las Vegas, Nevada. ASI Distributors Choice Award WINNER 11 Years in a row! ASI Distributors Choice Award Winner 10 years in a row! American Identity 2006 "Prestige Partner"